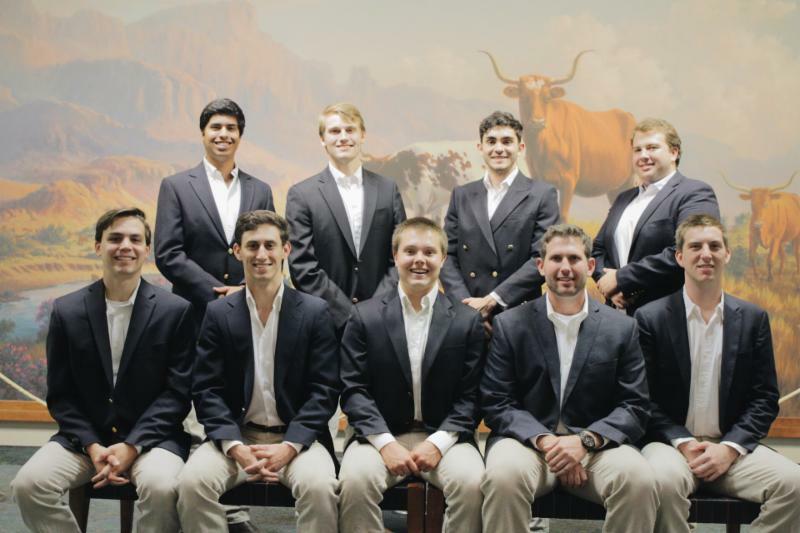 The new 2016-17 school year Beta Mu Officers are: (seated L-R) Sergeant-at-Arms Austin Burcham '14 (The Woodlands); Internal VP Deryk Camazine '14 (Henderson); President Lucas Anderson '14 (Charlotte, NC); External VP Wes Greene '15 (Santa Ana, CA); Secretary Chris Roland '14 (Arlington, VA). Standing L-R: Social Co-Chair Matt Offill '13 (Beaumont); Social Co-Chair Alex Crutchfield '15 (Arlington); Treasurer Eric DeVelasco '13 (Houston); and Rush Chairman Colby Lewis '13 (Aledo). The Chapter has elected new officers who took office in mid-May and will serve until May 2017. Beta Mu Chapter had two presidents in the 2015-2016 school year, Tyler “TJ” Weido ’13 (Fall) and J.D. Swancoat ’13 (Spring). Weido graduates this month with a finance degree and is joining E&Y in Houston. Swancoat has one more semester in Austin before earning his double degrees in finance and government. Thanks to all of the outgoing officers and congratulations to the new leadership team!